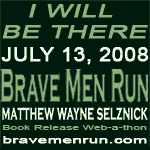 Podiobooks to Print: Brave Men Run by Matthew Wayne Selznick | Kris Johnson's Blog…sort of. Matthew Wayne Selznick‘s Brave Men Run: A Novel of the Sovereign Era is the latest podiobook to make the jump to the print market. The book will be released by Swarm Press this Sunday, 13 July 2008, and Matt has planned a day-long “Book Release Web-a-thon” to help promote sales on Amazon.com. There are plenty of details at the the book’s official site but the gist is this: beginning at 10am EST on Sunday and continuing every hour throughout the day, Matt will be streaming live video and reading new short stories set in the universe of his novels. Contributors include Mur Lafferty (Playing For Keeps), J.C. Hutchins (the 7th Son trilogy), Nathan Lowell (South Coast, Quarter Share) and other well-known podcasters and podiobook authors. Brave Men Run is the story of Nate Charters, a teenaged boy who is about as far from normal as teenagers get: he looks different and he has abilities that he has kept hidden from his peers for his entire life. But when the existence of the so-called “Sovereigns” is announced on live television, Nate learns that he is not alone, and his life changes forever. Brave Men Run is a superhero coming-of-age story that doesn’t feel like it was lifted from the pages of a comic book, but rather like it was born in the halls of your own high school and on the streets of your home town. Brave Men Run: A Novel of the Sovereign Era is still available as a free, serialized audiobook at Podiobooks.com, read by the author. The audio version was nominated for a Parsec Award in 2006. @P.G. Holyfield – I was just checking your self-promotion mojo; it’s intact and functioning normally. Pingback: KJToo » Hire These Guys, Willya?